It is strongly recommended to take an export of your application before beginning the migration process. This will enable you to easily revert back to the original application if necessary, before making any changes to your application and its metadata. Once you have migrated to the Universal Theme, you can not easily switch it back to the original legacy theme. 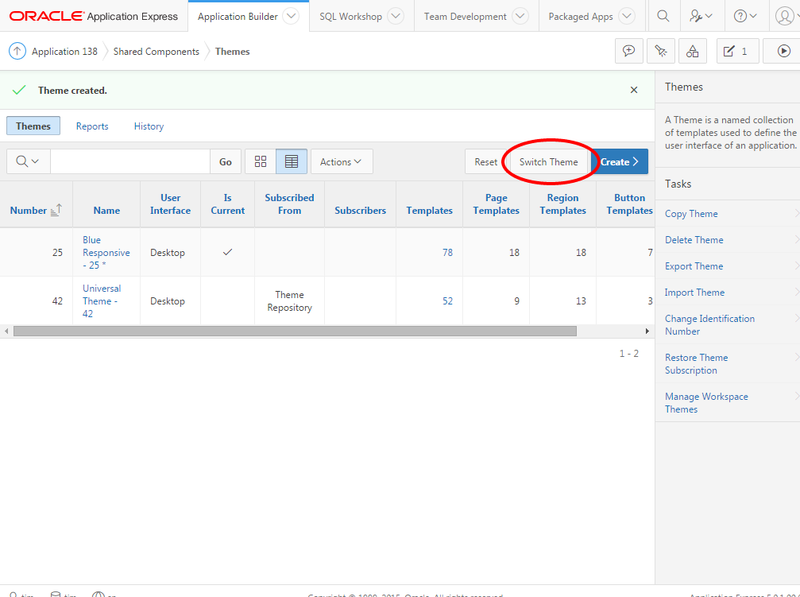 Additionally, if you re-import the original application, under a different Application ID, you can refer to this application to review how the application looked previously, as opposed to how it looks using the Universal Theme. 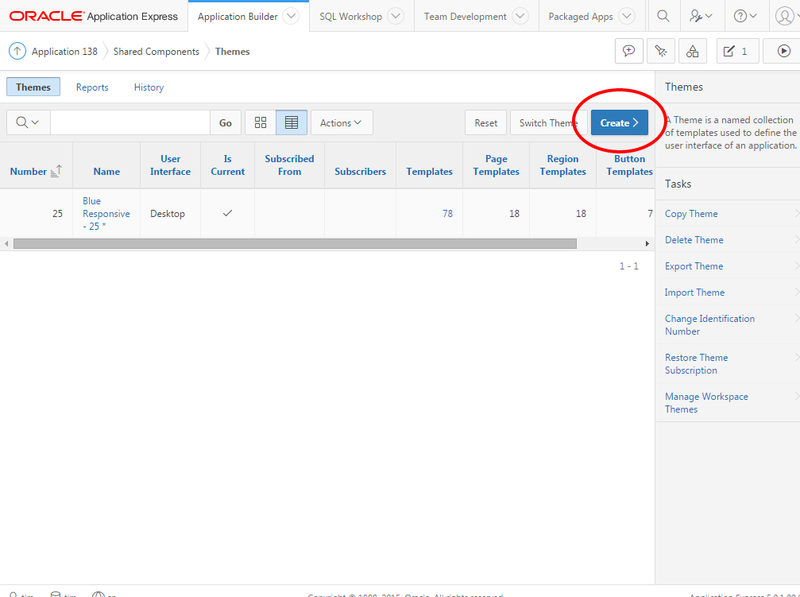 Use the Application Utilities > Upgrade Application to update certain built-in widgets in your legacy applications to the latest provided by APEX 5, e.g. FlashChart to AnyChart. This will ensure that those widgets take full advantage of the responsiveness of Universal Theme. 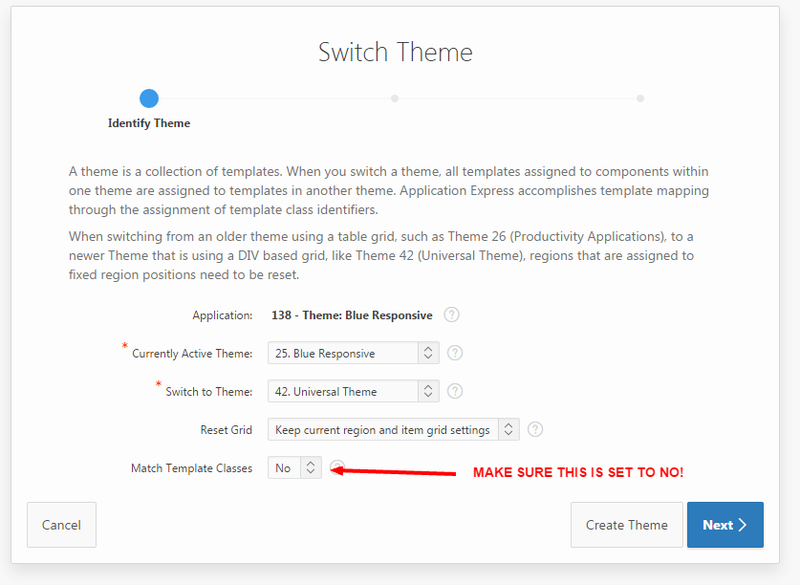 Note: If you have already installed the Universal Theme into your application, proceed to the Second Step: Switch to Universal Theme. 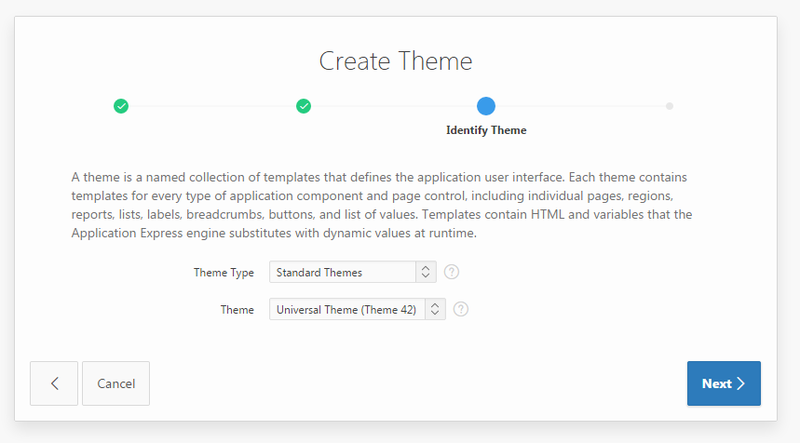 You need to install the Universal Theme into your application to get started. 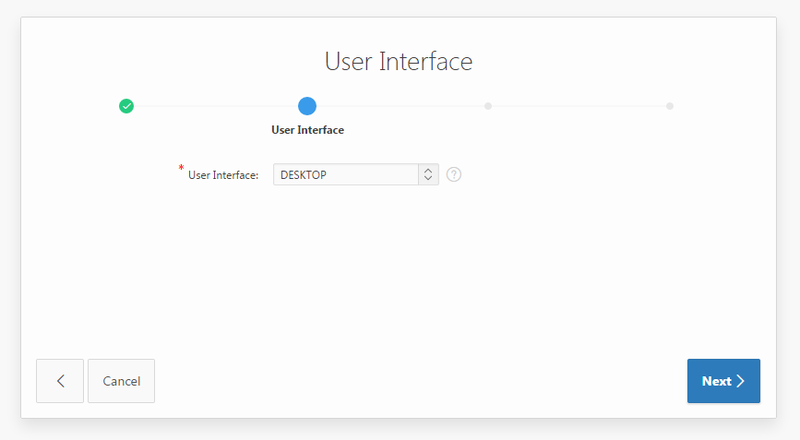 Select Desktop as the User Interface. 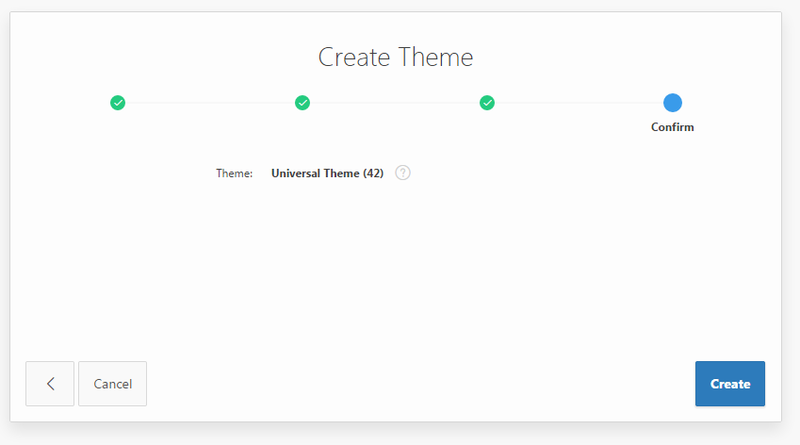 Choose Standard Themes as the Theme Type, and Universal Theme (Theme 42) as the Theme. Review your changes and click Create. Note: Not until you have completed Step 4 below will your application be irreversibly changed. Reverting back to a Tab-based application will be very difficult, which is why it is strongly recommended you have a backup of the application before proceeding further. Select the current desktop theme, and then select 42. Universal Theme. Depending on your application, you may choose to set the Reset Grid option to either Reset fixed region positions or Reset all region and item grid positions. Reset fixed region positions will maintain your current region positions, where possible, during migration. This is the recommended approach. Reset all region and item grid positions will ensure item and region positioning will be reset and will force regions and items to stack on top of each other. 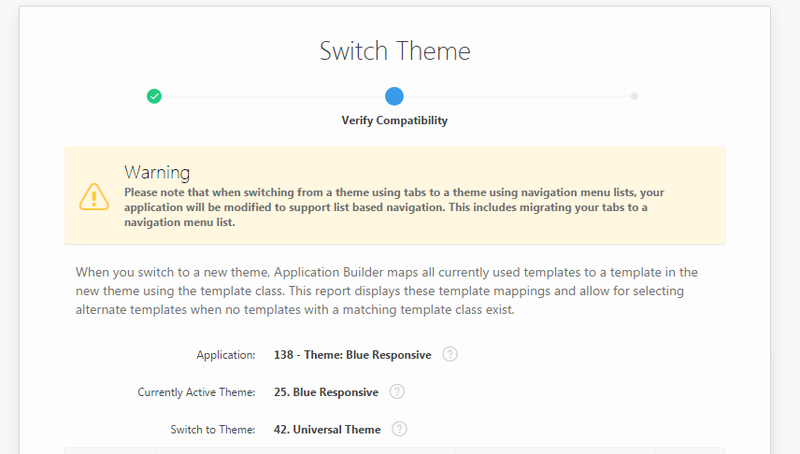 Verify that the mappings for your templates and Universal Theme templates are correct. Use the Universal Theme Migration Bookmarklet to automatically assign the right mapping, or check out the full mapping guide located at the end of this guide. 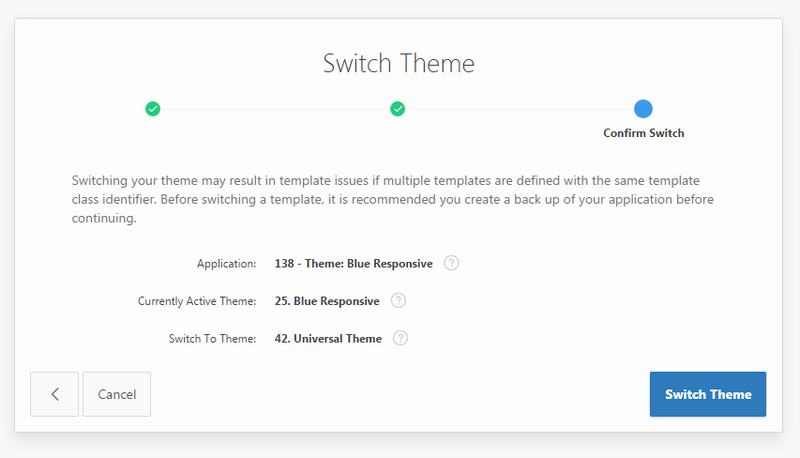 Most of the inconsistencies will be from new templates that Universal theme provides. Try to choose the template that best matches your existing template. 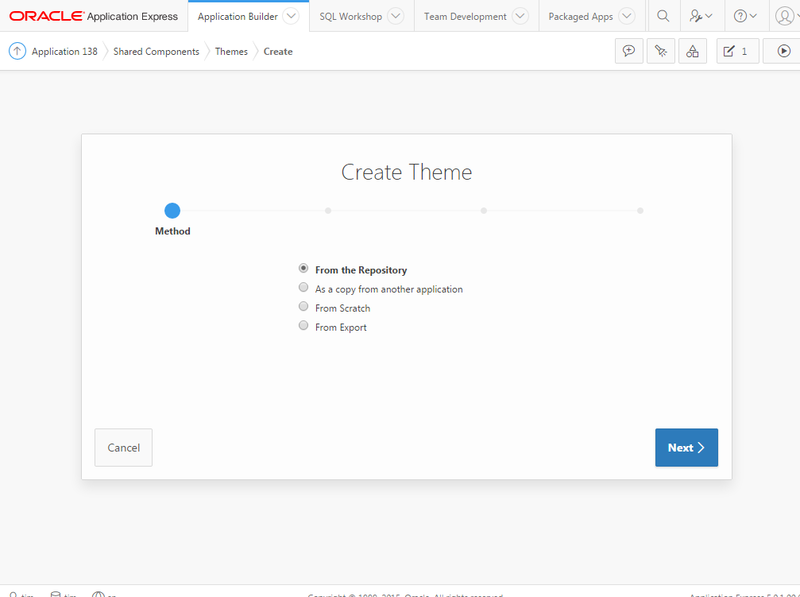 You may want to browse the components in the Universal Theme Sample Application to get a sense of the new templates and their various configurations.